Many industries have extremely specific requirements that must be adhered to under threat of penalty. Corporations are now tasked with the additional burden of understanding and complying with new e-Discovery rules and regulations. 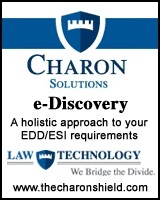 Charon Solutions specializes in helping companies understand, implement and comply with a host of rules and regulations specific to your industry. We can implement those policies and procedures or we can create new ones � and implement them � per your specific requirements. We can even provide the training necessary to prepare your staff to comply with your new policies and procedures.